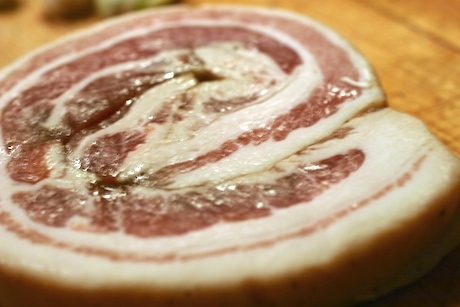 You have to love dinner guests who show up toting a bag of home cured bacon, lardon and pancetta! My dear friend Dario, and new friend Rebecca came bringing the fruits of their labor, and it is indeed wonderful. There has to be something so satisfying about curing your own pork products, you control how you want it to taste and what goes into it. When I mentioned to our son that Dario was curing meat in his apartment, Curtis’s first reaction was “ACK! That has to stink.” But, I’ve been assured that it doesn’t stink, but is in fact, a delicious aroma. The first time I thought about curing pork was in 2006 when I read Bill Buford’s article in the New Yorker magazine. The part about getting the pig home on a bicycle sounds just like something that I would try to do. I’ve carried home some pretty amazing things on my bike, but never a pig. There is a growing group of home curers,take a look at this chowhound link, and once we get back to Italy, I think it will be time to try my hand. I’ve got near perfect conditions in the garage, as long as I don’t park my car in there. Restaurants have been house curing as well, but it’s not legally sanctioned. Once again, I’m a proponent of informed awareness; I’m going to trust a committed chef over FDA approval. After all the FDA condones what goes on at Smithfield, and that defies belief. 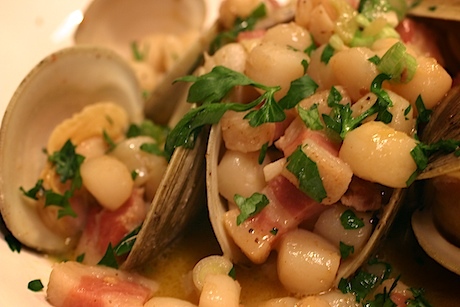 Last night we celebrated our piece of pancetta in a Portuguese combination of clams, scallops and pork. Quick, easy and all it needs is some crusty bread for sopping up the juices. In a sauce pan large enough to hold all the ingredients, on medium heat, sauté the pancetta, with a bit of olive oil and the smoked paprika. Then add the garlic and anchovies and cook until the anchovies have melted, about a minute or two. Add the scallops and coat in the pan juices, then add the glass of wine and the clams. As soon as the clams have opened, remove all the shellfish and place in warm bowls, top with the parsley and green onions. If there is a lot of pan juice, reduce for a minute or two, then pour over the shellfish and serve immediately. Have some good bread around for juice sopping! This is a hearty flavored dish and nice cotes du Rhone or young pinot noir wine would work nicely.